NEW VIDEO!! Just in time for Memorial Day Weekend, this is the easiest most delicious fruit dessert and it’s perfect for bringing to your weekend potlucks, BBQ’s and fun festivities! The other thing that I love is that it has really naturally made an easy transition from it’s original ingredients to our “allergen-free lifestyle” ingredients. I swapped out gluten free oats, beet sugar and coconut oil for the traditional ingredients and I have to say, in all honesty I think it’s better this way and many family members agree. 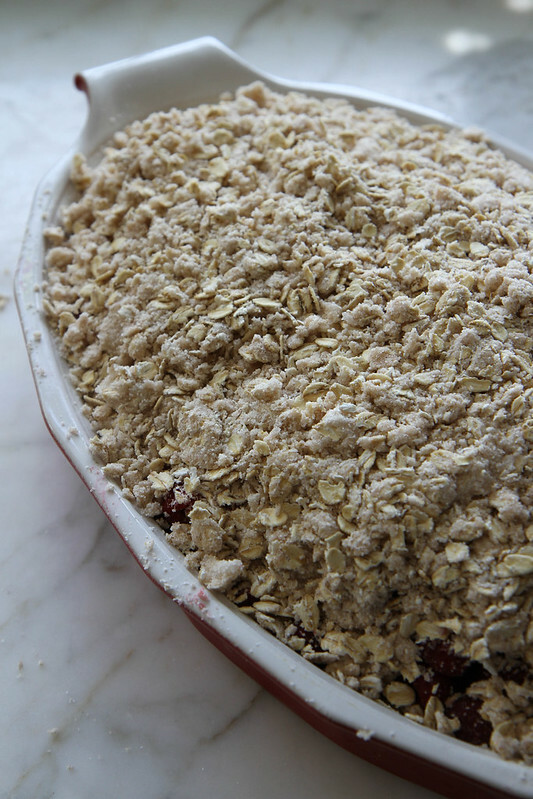 I love pulling this out of the oven when I have company over- the whole house smells like heaven and the crispy comes out with the berries all bubbly sweet and the golden, crispy crumbly oat topping is drool inducing. You can assemble the dessert early in the day and bake on demand, or it’s also delicious to bake early in the day and then leave it out at room temperature to serve later. You can serve it family style, scoop into bowls, or I have even brought one to the office, and everyone just filled their paper coffee cups! I thought this would also be nice to post before Memorial Day weekend so that entertaining would be easier than ever. Whether you are trying to eat allergen free or not- this would be a wonderful dessert for your family! I would top it with some whipped coconut cream or vanilla vegan ice cream to make it extra special! 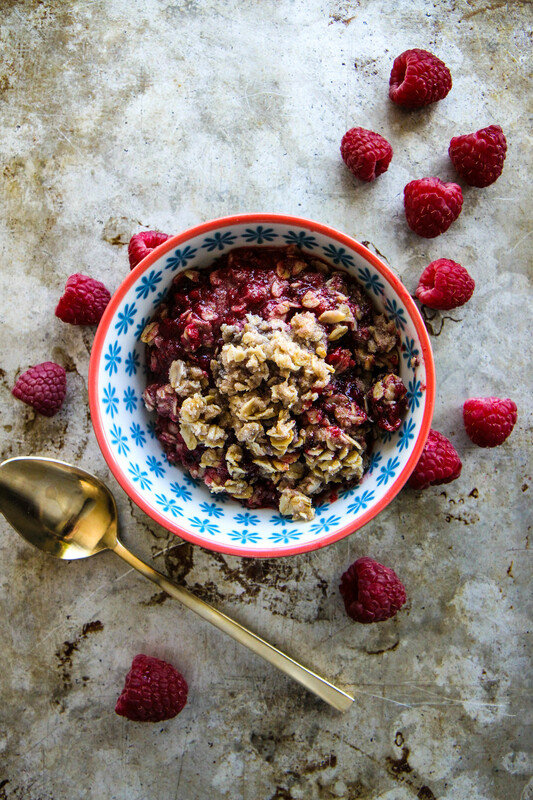 In a large bowl, combine the GF flour, baking soda, salt, cinnamon, beet sugar and 3 cups oats. Using a pastry cutter or forks, cut the coconut oil into the dry ingredients until you have a coarse crumb. 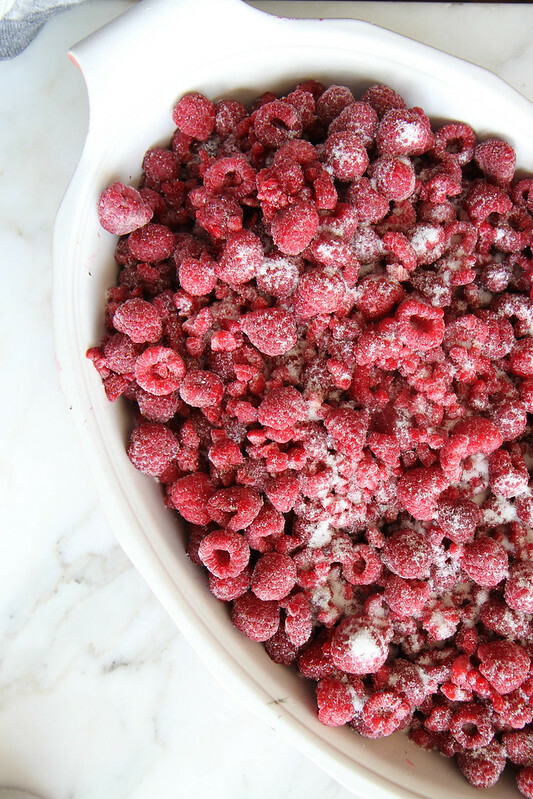 Sprinkle the raspberries with the 2 tablespoons sugar and cinnamon and mix well. 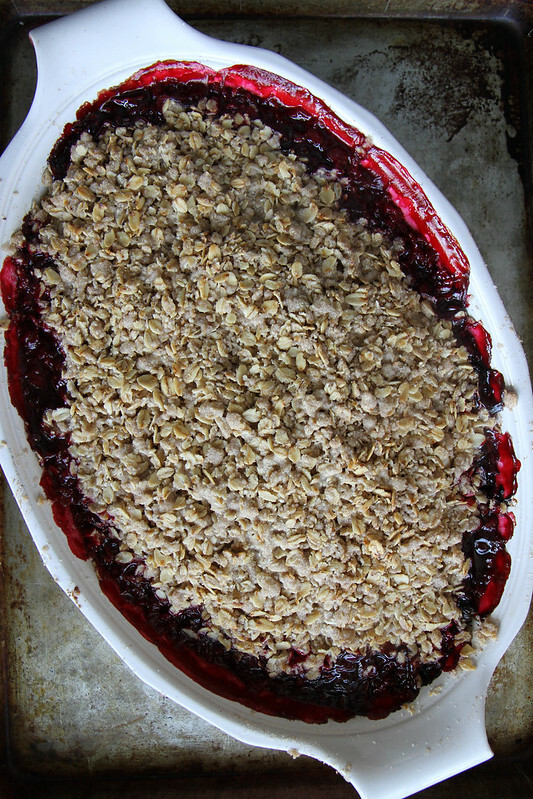 Grease a 9×13” baking dish and fill with the fruit mixture. Sprinkle the crisp topping over the top of the fruit. Bake the crisp for about 60 minutes or until the fruit is hot and bubbly and the crispy is golden brown. 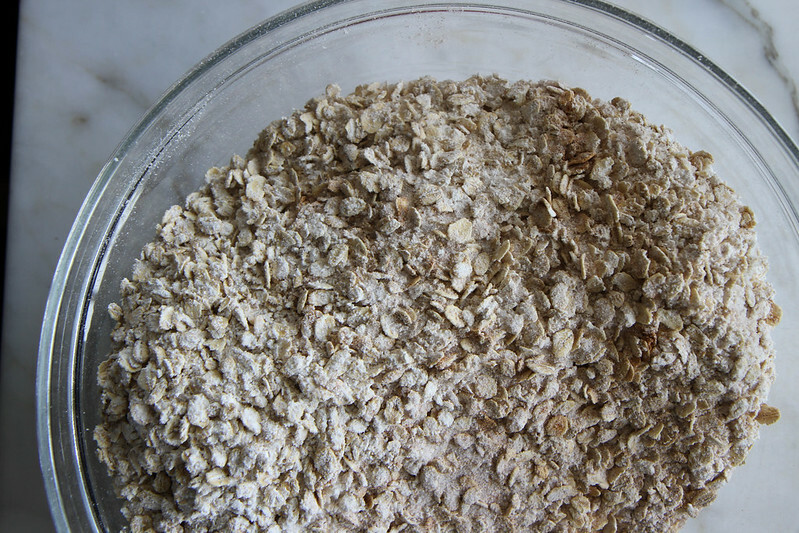 In a large bowl, combine the GF flour, sugar, 3 cups oats, baking soda, salt, cinnamon and coconut oil. Using a pastry cutter or forks, cut the Coconut oil into the dry ingredients until you have a coarse crumb. 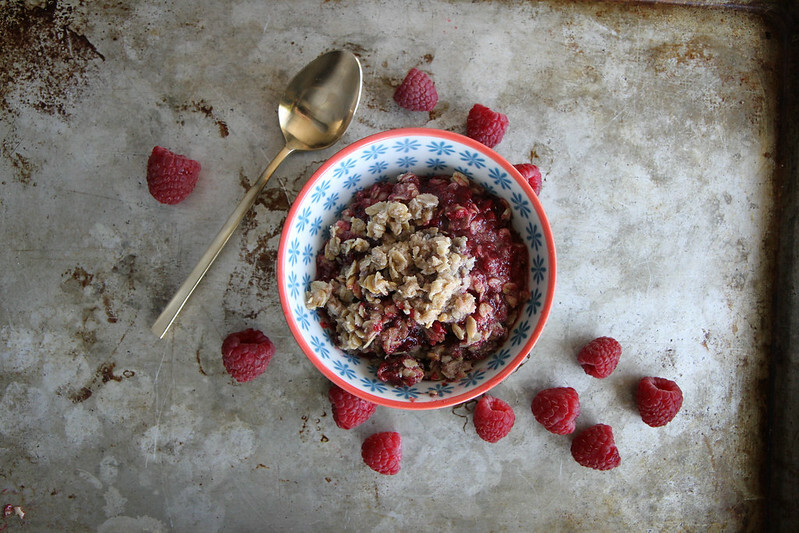 Sprinkle the raspberries with the 2 tablespoons sugar and ½ teaspoon of cinnamon and mix well. Bake the crisp for about 60 minutes or until the fruit is hot and bubbly and the crispy is golden brown. Let cool slightly before serving. Love that you kept this both vegan and GF….that’s awesome! And I love raspberry crisps and crumbles. Pinned! Crisco was mentioned in the recipe…but I presume this is to be coconut oil? 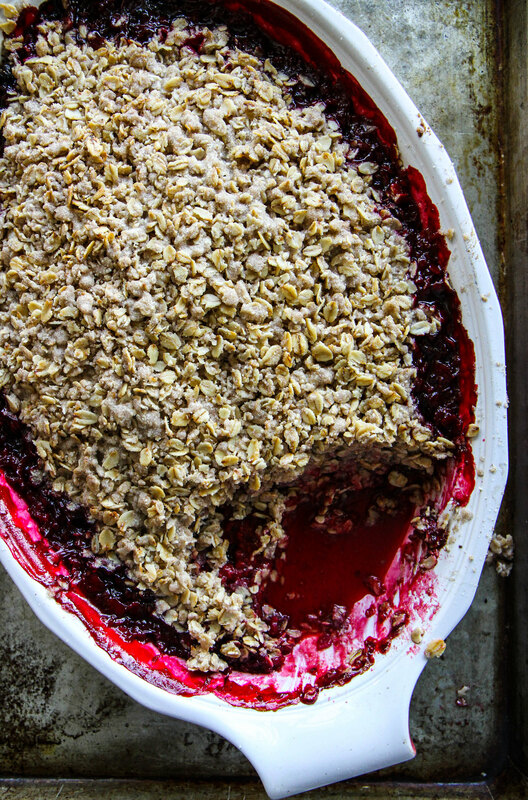 I love a solid berry crisp like this! So yummy! Lovely! Happy Mother’s Day to you! I could eat this for breakfast ,dessert, always! I was just thinking that maybe I will have this for breakfast Abby!! Beautiful crisp, love all the crumbs. I always like sneaking a serving for breakfast ;). omg mom- wait till you get home and realize that dad watched a special on PBS and is going GF too! the whole dang family…. This is so yummy! I made this on Friday for my son’s family birthday party. No one had any idea it was vegan. I didn’t have beet sugar, but I did have palm coconut sugar and it was great. I also used frozen blueberries, since that is what I had on hand. Everyone loved it! Thank you, thank you! Also, on another post you asked, if you should finish reading the Divergent Series and begin Fault in our Stars. Uh…YES to both! Although I’m not sure how you have time to read, but both of these are great. My soon-to-be 12-yr-old, read all of these books before me and encouraged me to read them. Definitely have tissue around for Fault in Our Stars. The week before Mothers Day, I was in AZ by the pool, a friend next to me was reading it and tears started streaming behind her sunglasses. It is a sweet story. My daughter and I read a lot of books together. I love it. Happy Reading! This was yummy! I cut the recipe by 4 for 2 people in 8×8 pan. I used organic brown rice flour with the oats and coconut sugar. I added teaspoon of chia seeds to fruit (2 1/2 cups raspberries/blackberries/blueberries/strawberries). Baked for about 30 min and served with coconut ice cream. OMG! I want a bowl of this right now!! Sounds good, can not wait to try it. I am wondering why so many “allergy free” recipes recommend Bob’s Red Mill? Is there an allergy free version of this product? Every bag I have checked has Been processed on equipment that processes peanuts and tree nuts. This recipe got me to your site. Want to make a 8 x 8 inch pan as opposed to 13 x 9. Can I halve the amounts? Should I keep the 60 minutes baking time or take it down to 40 minutes. Can’t wait to hear from you. I love that I have your blog to refer for clients who have to/wish to avoid certain allergen foods! I can’t wait for raspberries to be in season here (Canada..ug!) so I can make this. You rock! Hi Heather. I am wondering if there is a good alternative for coconut oil?